The dome of the Uppsala Schmidt, used by the SSS, on the left. The Siding Spring Survey (SSS) is a near-Earth object search and detection program that uses the 0.5-meter Uppsala Schmidt Telescope at Siding Spring Observatory, New South Wales, Australia. 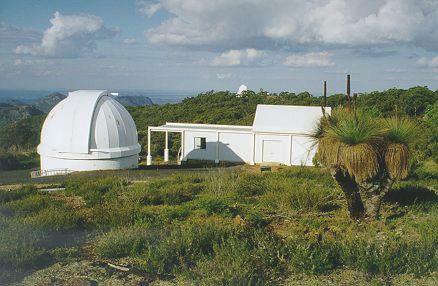 It is the Southern Hemisphere counterpart of the Catalina Sky Survey (CSS) located in the Santa Catalina Mountains on Mt Bigelow, near Tucson, Arizona, and is jointly operated by the University of Arizona and the Australian National University (ANU) in Canberra, with funding from NASA. Unfortunately, further operation of the SSS is now threatened by budget cuts. In October 2011, the Catalina survey cut off funding partly as a result of the deteriorating exchange, leaving the SSS dependent on local and temporary support from the ANU. With this short-term funding due to run out in July 2012, the South Hemisphere could be left without any substantial program to give early warning about potentially-hazardous asteroids and comets approaching Earth from below 30 degrees latitude. If the survey is forced to close, the planet will have a major blind spot until the Large Synoptic Survey Telescope, in Chile, comes on stream in the 2020s.